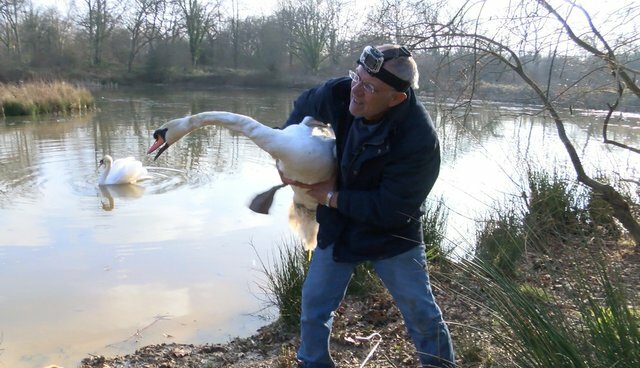 Simon was called to Bookham Common to assist Ranger Ian Swinney, who was concerned about a swan on one of their ponds, with a crooked neck. Although catching the swan was a challenge, Simon eventually succeeded and brought the swan back to the hospital for our vet to examine. An X-ray showed that the bent neck was in fact an old injury, and thankfully not lead poisoning as first suspected. The swan was coping perfectly well with his crooked neck, so we immediately released him back to his mate, who obviously doesn't mind his "unique" look! To see the first time Simon took a swan beating, click here.